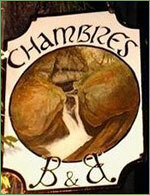 Les Glycines bed and breakfast for walking, hiking and cycling holidays in national forest and the Monts D'Arree. 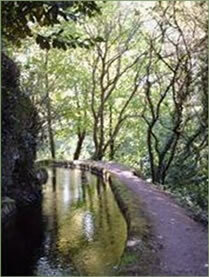 Situated in the Parc Naturel Regional d'Armorique, Huelgoat nestles in an area of outstanding natural beauty. 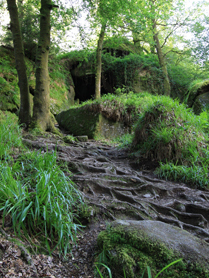 The name 'Huelgoat' is formed of two Breton words: 'huel' which means 'high' and 'koat' which means 'forest'. The town sits on the edge of a 600 hectare forest offering many possibilities for leisurely strolls or a longer hike to discover 'Le Sentier du Clair Ruisseau', Le Circuit des Chevreuils, La Mare aux Sangliers and La Grotte d'Artus. 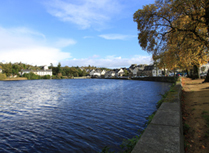 The town also surrounds a large lake which flows into the Riviere d'Argent over huge granite boulders (a feature of this area) at the 'Chaos du Moulin'. The Moulin houses our local tourist office. The lake is the home of a variety of wildlife and birds and fishing is permitted for carp, pike, perch, roach and tench. Fishing licences available locally. The town has always been an attraction for artists and writers and can boast past connection with Victor Segalen, Paul Serusier, Maurice Denis and Charles Le Goffic. 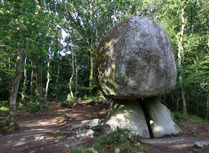 La Roche Tremblante - a 137 tonne rock which, if you can find the right spot to touch, literally trembles on its axis! Le Camp d'Artus - dating from one century BC, this celtic camp was a bastion of the Osismes, a celtic people from Western Armorica. It was used again during the Roman occupation of Gaule. L'Arboretum du Poerop - boasting 3,600 species of trees and shrubs from all over the world, a herbal garden (medicinal and culinary), a plant nursery and an exhibition room and a cafe. Le Jardin de l'Argoat - botanic gardens evoking the four continents. Nearby is the fountain of Notre Dame des Cieux. 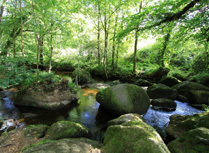 North West Finistere Coast: A dramatic and rugged coastline. Visit Saint Pol de Leon, Ile de Brehat, Meneham to name but a few fascinating areas to discover. Morlaix: A picturesque medieval town on the estuary of the River Morlaix. It has an imposing 19th century viaduct, jacobean churches and a lively traditional market on Saturdays. 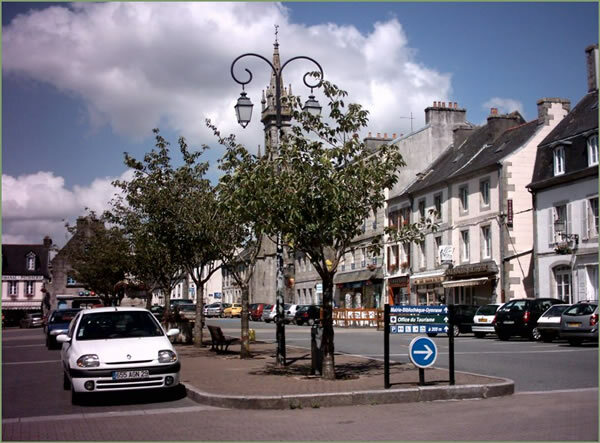 Carhaix: A small but bustling town, believed to be the site of the Roman city of Vorgium. It is now home to one of the biggest annual pop festivals in France, 'Les Vieilles Charrues', which takes place each July. 20 minutes from Huelgoat, Carhaix also has a golf course and an excellent adventure/assault course (Adrenaline Carhaix), offering all levels for all ages. You can also find ten-pin bowling, karting and an excellent swimming pool. Quimper: (Kemper) offers a great day out for those in need of a shopping fix (good for chic boutique shops) with a leisurely lunch in one of its many restaurants or cafes. 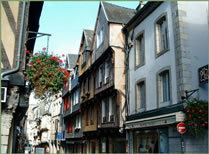 Quimper sits on two rivers, the Odet and the Steir and has picturesque cobbled streets and interesting architecture. It also boasts the pottery museum and the Musee des Beaux Arts. Saint-Herbot: Visit the gothic-style church dating from the 15th/16th century. The saint lived during the 8th century and, after many tribulations became the patron saint of cattle. His feast day is 17 June. Berrien Visit the standing stone of Kerampeulven and the remains of the medieval village of Goenidou.